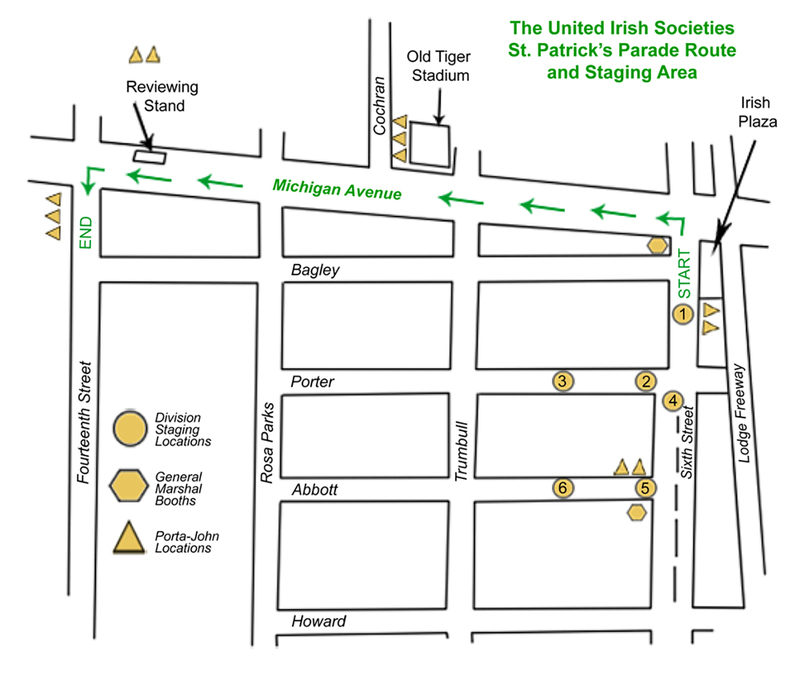 All Division Marshals must report to the General Marshal’s booth on Sixth St. and Michigan Ave. one hour (10:30 am) before assembly time to receive their Marshal’s arm band and additional instructions. Line up your divisions properly – only 10 abreast. You are responsible for the appearance of your division during the entire parade. Be proud of them – keep them in line. Report all deletions to the General Marshals 15 minutes prior to starting time. Don’t physically or verbally abuse anyone. Any problems that you cannot resolve – please see the General Marshals. No drinking of beverages of any kind is allowed during the parade. The throwing of any type of candy, mementos or souvenirs is prohibited. The United Irish Societies does not endorse any individual candidates for any elected office, consequently no political advertising of any type is allowed in the parade.